Before I get started with the review, I want you all to study the cover on the left, because art of this quality is a rare thing to find. It looks like a fine Renaissance painting, the human form replicated painstakingly, the muscles and ligaments stark across the outstretched arm. Yet the flesh transforms seamlessly to stone above the shoulders, the head mutated into a grotesque, roughly carved rock, barely the suggestion of a face lingering in terrified confusion. Even the logo is situated and styled in an aesthetically pleasing manner. The artist of this excellent work is Nicola Samori, who was also responsible for the cover of Behemoth’s most recent venture. I think it’s safe to say we will see his classical horror illustrations on more metal covers in the future. With its haunting epic doom, The Room is certainly a suitable vehicle to bring this future one step closer. 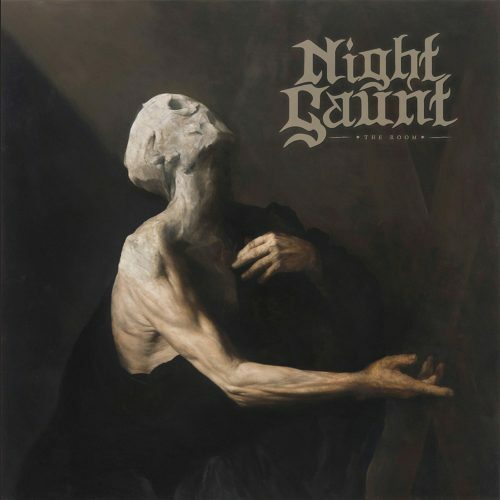 One thing the doom-loving gents of Night Gaunt absolutely nail is atmosphere. The Room has oodles of it, right from the title track that kicks it off. Echoing guitars and somber evocations paint a perfect picture of a gloomy Victorian haunted house. Vocalist Gc uses double-tracking and reverb in just the right amounts to make his unsubtly wavering style sound truly frightful, as if quivering in fear at the apparitions before him. The bass thumps and thrums ominously underneath the lurching riffs, like an approaching poltergeist banging on the walls. While I can’t tell whether it’s a concept album, it feels like one, a sensation other concept albums miss half the time. It surely helps that closer “The Owl” re-uses the main melody of the title track, deftly expanding upon it, both bookending the album and giving the title track a retrospective sense of foreshadowing. Where Night Gaunt stumble the most is when they go for crushing heaviness. 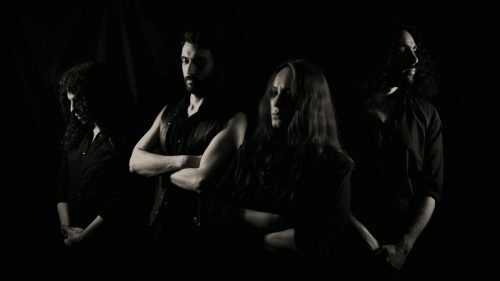 “Penance” is an early case; though it contains some effective sections, the band’s sound does not lend itself to the steam engine death-doom pummeling that overtakes the second half. “Veil” is the worst offender though, offering little beyond these ill-advised riff-fests. It merely highlights that riffs are not the strongest point of the band. Not that the melodies are bad, but they’re not too memorable, refusing to take up firm residence in the frontal lobe. The strength of the album lies in atmosphere, not in hooks, and I’m not sure the band completely realizes this fact. The production double-underlines this point and puts a couple of bold exclamation points in the margin for good measure. Simply put, the sound here is muffled, which wreaks havoc on the definition of the low-end, blending it together into an echo-filled fuzz. Heaviness through distorted riffs doesn’t land well in this environment; they don’t have the clarity to stick and merely sound unfocused. However, you can practically smell the mold and dust on this sound, perfectly setting the decor. The ominous plucked tones and vocals can pierce the veil just fine, giving something to hold onto in the gloom. When the heaviness comes from adding additional layers to the more Gothic aspects as they do on “The Owl,” the result is spectacularly lugubrious. Rarely do I find myself wishing for an Italian band to lean into the theatrical side of their performance more, but Night Gaunt are so clearly better at that side of their sound it has me wishing for more focus on their minimalist haunting. Gc has a voice for evocation, not aggression, and the suitably cobwebbed production doesn’t play well with hooky riffs. But with the mood so expertly set, The Room wins me over in the end, particularly with their demonstrations that they can combine heavy with spooky. Here’s to hoping the sequel will strike that balance more often because that’s when the magic happens. Dark, gloomy, spooky magic.